When I was growing up, the old rule stating that people weren’t to talk about politics was still in play, to a large degree. But not within our family. We were the Great Debaters, with every one of us having strong opinions and not being shy about voicing them. Disagreeing was a side dish at many family dinners, but not to the detriment of relationships. Outside the family, I was mortified when I found out one of my friends, as well as her family, was affiliated with a political party other than the one I chose. How could she? I thought. Doesn’t she know what they believe? Yet, that family didn’t match the stereotypes I’d formed in my mind. It was an important moment, realizing that good, God-fearing people were on both sides of the fence. We just saw things differently; it didn’t change who we were. My grandmother was quite eloquent in her political beliefs; many presidents, as well as football referees and baseball umpires, were advised and chewed out from the comfort of Mom’s living room. “He’s a damn liar,” would fly across the room during presidential speeches. Most memorable was her, "Once an actor, always an actor" response to Ronald Reagan's campaign promises. I can't recall all of her presidential debates of this sort, but Reagan and John F. Kennedy (post mortem) stand out the most. When I turned 18, I was nervous and unsure as to how the whole voting process worked. I knew the political literature handed to me on my way into the location couldn't go into the booth with me. Fearing incarceration at a young age, I steered clear of anyone with papers in their hands, as I walked into the local junior high, my old alma mater, to vote for the first time. Not having done my own research, I voted for the people Mom voted for; we thought similarly on many things, and she knew about the candidates in all types of elections. But before the next election, I spent hours poring over voter’s guides that were published and sent out with The Houston Chronicle. I read articles in magazines. It was a massive undertaking, but I studied as if I were taking a final exam. For years, I made a handwritten list of all my selections, especially when numerous judges were on the ballot. As I grew older, I usually voted for candidates more than for political parties; my choices became more diverse. Throughout the years, there haven’t been many elections I’ve missed. Occasionally, though, my busy life as a twentysomething-year-old, or as the mother of a child with autism, would override my memory, and I’d forget to vote, and miss out. That’s exactly how it felt; I’d missed an opportunity to make a difference. For me, voting wasn’t an option; I was obligated to exercise a right that was bravely fought for me to have. I miss the way voting polls were set up in the past. 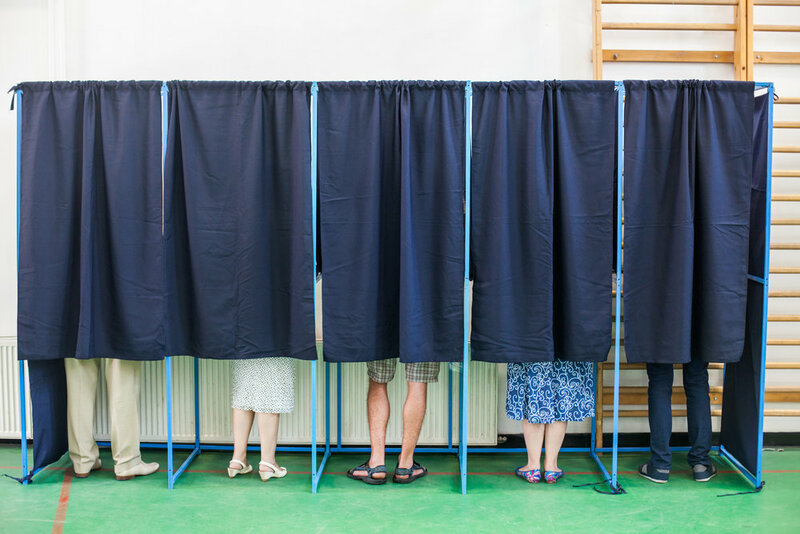 Somehow, voting has lost its sense of mystery and privacy. With the “Star-Spangled Banner” playing in my head, I’d nervously anticipate when it was my turn. After being handed a long, thick-papered card, I’d walk into the booth, pulled the curtain around me so nobody could see, much like that wizard in Oz, and put the card into a slot. Every time, I prayed before I punch the holes in my ticket, casting my final decisions on who I thought was most qualified. It was an awesome responsibility; a power that’s both exciting and sobering. "We the People." One of the few freeing statements that will live on through times of peace or war, prosperity or poverty, ignorance or revelation. And I’m a part of "We." I still don’t take it lightly. Which is why one year, feeling desperate as the clocked ticked away on a presidential primary election day, I took Cowboy to the polls with me. Earlier in the day, I’d called Flash to see what time he’d be home from work. “I’ll be home after I vote,” he said. I’d been hoping he’d get off early, so I wouldn’t have to attempt the impossible. But my Election Day OCD demanded I not wait until 45 minutes before the polls closed. “Okay, Cowboy, we have to go vote,” I explained to my 10-year-old, after hanging up the phone. All he heard was “go,” and he was at the door, waiting. It never mattered where we went, just leaving the house was cause for celebration on his part, and prayers for energy on mine. I walked into the voting location with an arsenal of activities to keep Cowboy busy. Okay, not really. But that sounded better – less stupid. I should’ve taken a portable DVD player or squishy toys or Cowboy’s favorite music or his grandma. Instead, I went in with nothing but my purse and my son, pretending we’d blend in. The line was incredibly long, and the tiny local elementary school library was packed. This was during Cowboy’s hyperactive, quite-loud-in-public years. After an hour of standing in line, I handed out certificates to everyone present for their completing my crash course on Autism Goes to the Polls. Everyone was polite towards us, and I exchanged smiles every now and then with some of them. They looked understanding and compassionate. But when I looked around the room, I saw we were only halfway to the voting machines; the line snaked through all the bookshelves, and still looked a mile long. I was stunned; nobody does that when you’re not directly behind them. There were fifteen people, who were also tired of waiting, between me and him. As I glanced at those in front of me, they were all giving me approving head nods. I thanked each one of them as Cowboy and I made our way to the front of the line. When it was my turn, I said, “Okay, Cowboy, let’s vote.” We walked hand-in-hand to the machine; I had a death grip on him with my left hand, as I turned the wheel and pushed buttons with my right. Soon, we were finished, and made our exit as Flash made his way into the building. When I voted last week, I felt the same feelings as the first time, minus the fear of incarceration. I’d heard on the radio that early voters were turning out in record numbers, and my heart swelled. As I glanced around the room, I was proud. There was an elderly woman with a walker, who had to sit down to wait while the line moved up. Girls who looked not a day older than 19 were waiting, perhaps to vote for the first time. Hispanic, white, black, Muslim, married, single – I saw all of them represented that day, talking to each other politely. And, of course, I teared up. We were on equal ground. One people. It was a glimpse of “a more perfect union” I long to see. No backbiting, no rude remarks, no disrespect; I wished things could stay that way outside the walls of that building. I also wished I had Cowboy with me again, that time, so he could vote. But that’s a privilege he’s unable to exercise due to his autism. I daydreamed about how life might have been, and wondered who he would vote for, what issues would be most important to him, and what debates with him would’ve been like. I can imagine they would have been sprinkled with his good nature and healthy sense of humor. My daydream was cut short when it was my turn to vote. My heart swelled again, as I walked up to sign my name. It always does. I was thankful to have the right to make my voice heard. I turned the wheel, and pushed the buttons. And I realized, by the choices I make, perhaps Cowboy’s voice will be heard by proxy. Because he’s a part of “We” also, just like every American.